Patterned glass wheels are 50mm (2") diameter. 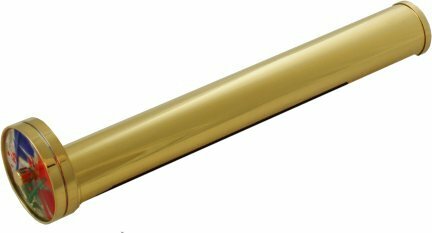 Polished gold plated brass cylinder with double brass rimmed patterned glass wheels. A beautifully made kaleidoscope with a polished gold plated brass cylinder & double patterned glass turn wheels to give stunning image patterns & colours. Look through the eye piece as you turn the brass rimmed wheels at the other end to give a wonderful view of ever changing colourful patterns. colours & patterns will change as you turn the kaleidoscope ! *Please note, these are not musical !